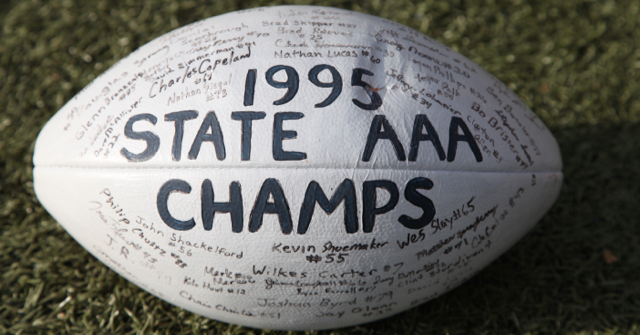 In the fall of 1995, a group of JA students put their hearts on the line to win their first state football championship. What is remarkable about their story is that their coach, Sherard Shaw, had lost his battle with cancer shortly before the championship game. This truly special group of men were back on campus Friday, October 23, to remember this first ever Jackson Academy football championship, their years together, and their beloved Coach Shaw. They gathered in the Upper School Library with their families, parents, and members of the Shaw family and were recognized at halftime.The Office of Alumni Relations began planning the reunion event several months ago with members of the Shaw family in anticipation of the 20th anniversary of the championship game. The family brought a football signed by the team in 1995 for the event. The football will become part of the memorabilia in Raider Hall.